Nick Mason has already spent five years inside a maximum security prison when an offer comes that will grant his release twenty years early. He accepts -- but the deal comes with a terrible price. Hamilton cleverly imbues the narrative with myriad of twists and turns, allowing the intricate plot to unfold with stunning and extraordinary skill and suspense ... As Hamilton invites us to investigate the hard truths of criminal behavior, he artfully weaves a gripping tale of escalating violence and psychological warfare that is at times both chillingly haunting and relentlessly hopeful. Hamilton's deceptively simple prose is fraught with internal emotional turmoil and intense physical confrontations, as he refreshingly refuses to shy away from the very current issues of police corruption and brutality that plague our systems of law enforcement. Mr. Hamilton gives this book a superb set of road maps, one for the Chicago Nick knows so well, another for the inner workings of Nick’s mind. Because Nick is a first-time character faced with a terrible moral dilemma, his thoughts need to be grippingly complex, and they are ... Though he flirts with some obvious clichés here, Mr. Hamilton uses them to his advantage. After all, chases and club scenes and daughter-loving dads wouldn’t be so popular if they didn’t work. And The Second Life of Nick Mason kicks off this new phase of Mr. Hamilton’s career at full gallop. It’s a tight, gripping book about a man hellbent on reinventing himself against long odds. By a writer who knows whereof he speaks. As fertile as Chicago is for crime fiction, it isn't often that an outsider captures the underside of the local scene as memorably as Steve Hamilton does with The Second Life of Nick Mason, the terrific first installment in a projected series ... Loudly promoted on social media, the novel more than lives up to its hype. In so doing, it introduces a promising second life for Hamilton as well. 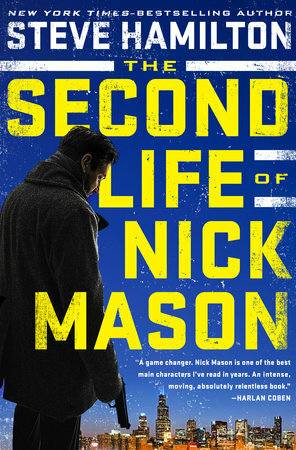 What did you think of The Second Life of Nick Mason?